Here Competent Authority of Bharat Sanchar Nigam Limited (BSNL) come back with its new promotional offer with special SMS pack under 2G and 3G Mobile Services across Himachalpradesh Telecom Circle. The HP Telecom Circle announced promotional offer on SMS pack of Rs.33/- and Rs.83/- for a period of 90 days under Prepaid services. SMS pack cost of Rs.33 offers, 330 SMS Free Local/STD on any network with validity for 25 days. 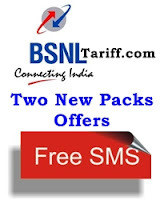 SMS pack cost of Rs.83 offers, 830 SMS Free Local/STD on any network with validity for 30 days. The above SMS packs will be implemented for 90 days and with effect from 06-06-2013.